There is a reason “cutting the cord” has become so popular in all manner of product categories. Being tethered to an outlet is restrictive, often inconvenient and even unproductive; realities that provided the motivation for Guy Robarge, director of innovation and process improvement for FBG Service Corporation, to consider giving battery-powered vacuums a try. Founded in 1960 and headquartered in Omaha, Nebraska, FBG is a facility maintenance and service provider, offering a broad spectrum of services to four main markets: education, healthcare, manufacturing and commercial office space, says Robarge. Its roster also includes some retail clients such as malls, grocery and big-box stores. In addition to its Omaha site (which has a corporate and a district office) FBG has district offices in Colorado, Minnesota, Iowa and Illinois. “In the last 10 years, we’ve refocused on our four primary markets, honing this focus,” says Robarge. This customer attention includes offering add-on services such as landscaping, snow removal, HVAC and a lot more. But the renewed focus also means FBG is investigating new products and processes that improve cleaning operations. In 2017, FBG started testing out battery-powered uprights, trying to determine whether these made sense for the company, and evaluating how well they might fit into the daily cleaning routine. 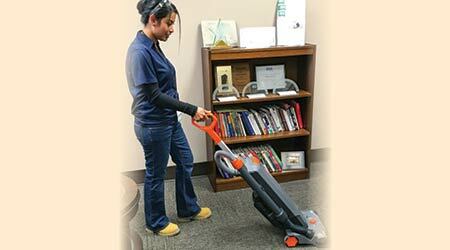 It was inspired to do so by the numerous advantages cordless vacuums bring to the table. Obviously, not having to drag cords around is a big benefit, says Robarge. Also, because of their cordless design, these vacuums offer greater flexibility and eliminate one source of trips and falls. They save time because the cleaning specialists don’t have to stop to plug and unplug cords, and improve efficiency because the specialists can keep moving in one direction. Additionally, not having to bend over constantly to plug and unplug is easier on backs, helping to prevent employee injuries and absences. Battery uprights are also kinder to furniture, walls and doors, since there are no cords to catch on or rub across them, says Robarge. The company currently has 15 battery uprights, mostly TTI Floorcare Hoover HushTone Cordless Uprights, using them in all four of its primary markets. The batteries last anywhere from 45 to 75 minutes depending on the vacuum and the speed used. There are two speeds: a higher speed to “boost” performance, and a lower speed that is quieter. In this quiet-mode, the battery will last longer, says Robarge. Charging can run about 60 to 90 minutes, depending on how low the battery is. Despite the higher upfront costs of cordless uprights over the corded models, Robarge expects cord-free technology will reduce costs and expenses. “The company has invested a lot of money in extension cords,” he says. But more significantly, the vacuums will also result in higher productivity, improving profitability. However, this is contingent on the cleaning program; the bigger the program the faster ROI is achieved.